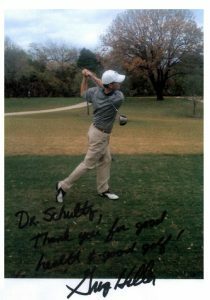 I am a professional golfer and have been seeing Dr. Schultz for almost 10 years. My health is one of the key factors of me performing my best. Regular chiropractic adjustments are one of the key factors in maintaining a healthy body and maintaining my performance. Without these adjustments my health regresses and so does my performance. I have had very few health issues over the years and I attribute part of this to regular chiropractic adjustments. Even when I have had a problem, I’ve recovered quickly by acting quickly with an adjustment. Dr. Schultz has always taken his time with me during my adjustments and is always open to exploring other ways to keep me healthy. He also takes some time to visit with me when I am in his office. This is evidence that he cares enough about his patients to get to know them. If you are interested in staying healthy or returning to good health I would highly recommend the services of Dr. Schultz in the very near future. About four years, I was diagnosed with deteriorated disks in my lower back from a childhood Scoliosis condition. I began chiropractic treatment which relieved the pressure and pain, in my upper and lower back. I continued my adjustments for a year in Phoenix, AZ until moving to San Antonio two years ago. One year later, I had a terrible relapse and was referred to Dr. Schulz’s office. Within the first adjustment, his chiropractic care quickly relieved all pain and pressure. I now continue my weekly adjustments and live with no discomfort. I am completely thankful that my health and quality of living is greatly improved. I have for years been in a lot of pain in my joints which I chalked up to arthritis and age. In 2006 my left hip hurt enough that I was dragging that leg and not being able to walk up steps without doing the right foot drag left up next cause of the pain. This brought me to the doctor because it was starting to effect my job. He had ordered x-rays of my spine and hip, these showed severe degenerative lumbar spine and disc disease with Scoliosis. My doctor said I would need surgery in time to relieve some of the pain. This choice I didn’t want and my husband suggested going to a Chiropractor which helped him years ago. I went to River City Chiropractic office and met with Regan Schulze, D.C. and he assured me he could help and he did just that. Over the last couple of years since going, alot of my discomfort has diminished and I don’t drag my left leg anymore but walk normal without limping. Grant you I have pain from my osteoarthritis but nothing like it was. I no longer take pain pills only ibuprofen here and there. Going and getting adjusted has given me the relief need to keep going and so happy I didn’t do the surgery thing and I trust in this and can only say thank you. Hi! My name is Guadalupe Becerra and I would like to tell you about my therapy with Dr. Noel Nolasco D.C. and his staff. My family and I were hit by a drunken driver and thanks to God we were not killed. My injuries as well as my family were treated by Dr. Nolasco and his staff. Honestly, I never knew how important therapy was for internal body injuries. Me and my family (husband and two sons) had neck, back, knee, arm, elbow and shoulder injuries and were required to have one to three months of therapy. Dr. Nolasco gave us a thorough report with x-rays on how your body gets hurt in accidents and thinking everything is alright in our bodies, but it is not. It is a process that makes a difference in healing the inside of your body injuries. With every treatment, our bodies co-operated and a difference is felt with time. On behalf of my family and I, we encourage everyone hurt in accidents to get the therapy needed as soon as possible. Even though it may take time, it is worth more than you can imagine. My family and I are living proof of what therapy did for us and our lives. A great thank you for Dr. Lilosco as well as his attentive staff. Dr. Nolasco and his staff turned my very horrible experience into one of relief. I have been hurt in car accidents in the past and have never received such thorough treatment as when I came here. Through his diagnosis and treatment, we stumbled upon unknown possible complications of osteopenia and arthritis, which if left untreated, would have possibly, resulted in a total change in my quality of life. Thanks to him, I’m on the right supplements and following through with adequate use of calcium and glucosamine. I can’t thank him enough for putting me on the proper path with diet and exercise. His staff is wonderful, friendly and a joyful addition to my days whenever I’m there. I was suffering from headaches and when I began having migraines, I decided it was time to do something. I came to River City Chiropractic and began treatment. After the first visit, I immediately felt some relief and no more migraines. After a few more visits, even the minor headaches were gone. What a relief!! In 1939, when I was 11 year old, my spine and back began to curve out of shape. I could feel the bones moving in my back. I could even hear them popping. When I told my mother about it, she took me to the neighborhood chiropractor. Some time later my mother took me to an orthopedist, Dr. Stuck. He diagnosed my condition as curvature of the spine or scoliosis. He placed a plaster of Paris cast on my torso from under my arms to my hips. Before he put the cast on my torso, he straightened my back by wrapping a cloth around me and pulling until my back was straight. Then he set the cast. I wore this cast for 3 months, from June through August of 1940, the summer before my 7th grade year. Soon after the decision against surgery, I started going to Dr. Petri. His office was located in the Aztec Building in downtown San Antonio. I went to him from my junior high years through my twenties. He kept me healthy and free of pain. He also asked me why I wore glasses. I told him that my left eye always crossed to my nose. This began happening when I was 5. Dr. Petri commented that he would work on this condition. When I was a sophomore in high school, I stopped wearing glasses. He had corrected my strabismus. When I went for an eye exam, the results of the exam showed that my eyesight was normal. I did not have to wear glasses again until age 39. In 1967, I began working as a teacher aide in Kindergarten. During this employment, I played with the children, exercised in physical education, and sat on the floor with the students in the class. I was a teacher aide for 25 years, retiring at age 65, and then after retirement I continued working at the same school as a substitute for another 14 years. I am extremely thankful for my good health. I am also thankful that I can do my daily exercises and do not experience constant pain. The daily exercises keep me limber. I know it is the many years of treatments that have kept me healthy and pain free. In September 2008, I turned 80. At the present time, I do not use a walker or cane, still drive a car and of course, still do my exercises!